For many women, winter is the season of dry, itchy skin - but for many other women, skin can be itchy, dry, and irritating year-round. Suffering from dry itchy skin can be frustrating and can sometimes even be distracting from daily tasks and chores. 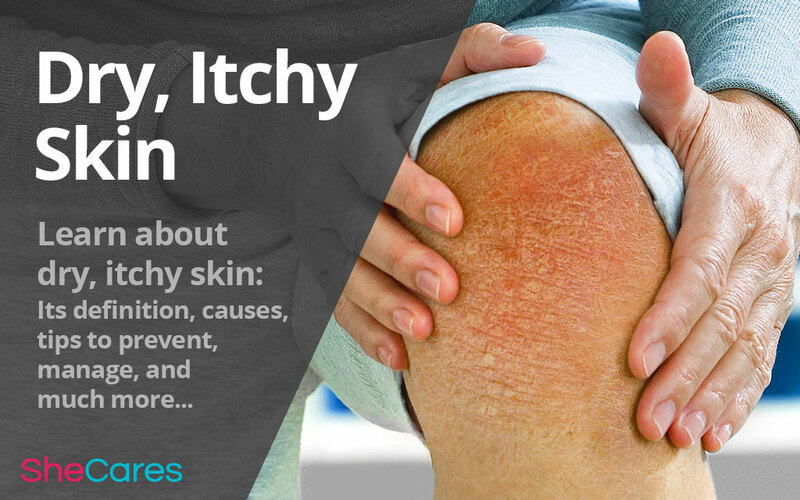 Learn more about dry, itchy skin as well as its causes and treatments. Usually, when skin becomes dry, it also becomes very itchy. This is because the itch is a way of the skin signaling to the brain that something is wrong and needs to be fixed - moisture is necessary for the good health of the skin, so when the skin doesn't have enough of it, it begins to itch. Dry skin often goes along with scaly, rough, or flaky skin. A lack of moisture changes how skin cells grow and die, which changes the appearance and often the feel of the skin. Understanding what has caused the dry, itchy skin can be the beginning of understanding how to heal the skin. Often, dry skin is caused by one of the following factors or a combination of them. When estrogen levels in the body decrease - as they often do during menopause, for example - it also lowers levels of collagen in the body. Collagen is needed to produce strong, healthy skin that can absorb the proper amount of moisture and grow correctly. Without enough collagen, the skin is likely to dry out faster and more easily. Winter is one of the most common causes of dry skin because it brings a drastic change in the temperature - which can affect the skin - and the heating inside most homes and buildings dries out the air. When the air is dry, skin is more likely to lose moisture. There are many different things that can irritate the skin when they come into contact with it. These may be harsh chemicals, or they may be otherwise harmless materials that simply cannot be tolerated by certain people's skin. When there is something that your skin is irritated by, it is likely to become dry and itchy if it comes into contact with the irritant. Several chronic skin conditions can cause damage to the skin, eczema being the most prominent. Most of the time, the damage that these conditions cause results in the skin becoming dry and itchy. If the itchiness of your skin lasts for more than two weeks, or if it causes extreme discomfort and interferes with your ability to sleep, you should consult a doctor. Another reason to see a doctor is if these natural remedies provide no relief. A medical professional can examine your skin to determine the underlying cause, and they can help find a treatment regimen that works, possibly using medicated creams for relief. Read more about how to treat and manage itchy skin of all types.